Pity the poor winter radish. Unassuming, plain, dare I even say homely . . . on the outside. Oh humble vegetable of hidden delights . 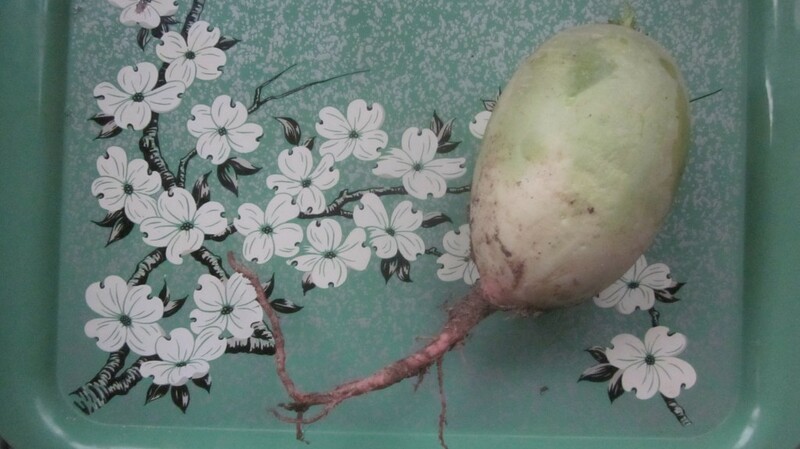 . .
From the outside, you might think that the winter radish (or beauty heart, or misato rose) is just a smallish turnip. Its lime green shoulders and creamy white sides give no hint of the loveliness inside. No, only the snerly pale pink root hints at what you’ll find when you slice it open . . . The small radishes you see in the grocery store or the farmer’s markets are quick to germinate and grow–you can go from seed to radishes in 3 weeks!–but winter radishes grow slower, bigger, and definitely more beautiful. And of course, much more mysterious. 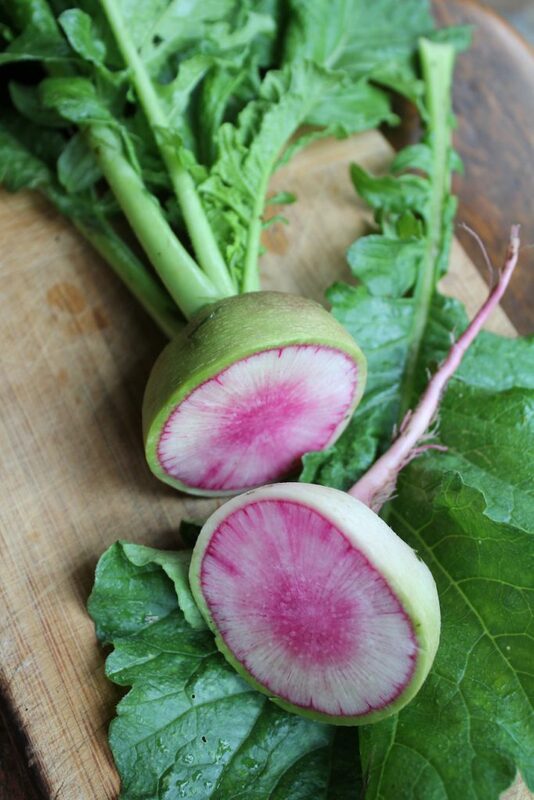 These roots are not easy to find in your grocery store or farmer’s market, but they are the original radishes–prized for generations not only for their crunch, their delightful color and their sassy taste, but also because they will keep for months in your refrigerator or root cellar. Their diminutive cousins, left in the ground too long, will turn to woodiness and be good only for chicken fodder . . . and that’s only if your chooks are not fussy (mine are spoiled rotten). But not the secretive winter radish is a different animal, entirely. You might say. If by chance you happen upon one of these international veg of mystery at your favorite place to buy veg, or–even better, if you have some growing in your garden–take it home and put it on your cutting board. Note its plain Jane appearance. Then slice one open and give yourself a moment or two to admire the deep pink or fuscia interior with its surprising starburst pattern. Does it not dazzle you? I know what you’re thinking, Gentle Reader . . . as I so often do. 🙂 You’re thinking “but what do I DO with this enigmatical and stunning veg?” Well, I’m here to remind you that there are no rules to eating winter radishes. Use your creativity and eat it raw or cooked. You can peel the tough skin off, slice it into juicy wedges, sprinkle with a bit of sea salt and freshly-ground pepper, and munch away. Or . . . grate it up into salads for a pleasant tangy crunch, add it to your next batch of fermented kimchee (that’s what I plan to do!) or grate it up and ferment it on its own. OR . . . you can cook winter radishes as you’d cook turnips: boiled and then mashed with a bit of butter and a grinding of fresh salt and pepper, of course, although I think my favorite way to eat them (so far–I’m still experimenting!) is to roast them with other root vegetables, like carrots, beets, and turnips. When roasted, winter radishes become even sweeter and surprisingly delicious. They’re good cut up into chunks in soups and stews, too. Here are two ways to prepare this beautiful and mysterious vegetable, and I got these ideas from this excellent website. Enjoy! Melt butter in cast-iron skillet and add radish chunks. Put into 400 degrees oven, and roast until radish chunks are tender, stirring every 10 minutes or so. Add brown sugar and vinegar and salt and pepper to taste, cook for 1 minute more, and serve. Place shredded radishes in a bowl and sprinkle with the salt. Cover with a heavy plate and refrigerate overnight. Drain off all the liquid and wash in cold water in a colander. The shreds will be transparent and tender. Prepare a dressing by combining the oil, wine vinegar, salt and pepper, and pour over the radishes. Refrigerate until ready to serve. Add soy sauce and sesame oil if you like your salad to have an Asian twist. That’s it! I’m happy to have helped you learn a bit about this inscrutable veg! Have a lovely day, dear friend! ← Make your own tomaisins today! Gorgeous! Do you grow them yourself? Yes, Caro–you know I do, of course in huge quantities . .. I’ve got plenty to share! Hi again Amy, I’m visiting from UBC. I love radishes and am growing a few rows under some plastic tunnels. This is my first experiment with a winter crop. Hope it works. One of my most favourite way to eat them is cut up in rounds on a sandwich with maybe some salami. That’s how my grandfather used to make it for me when I was little and I still love it. Thanks for the recipes, I think I’ll try the rose heart salad. 🙂 Hope you have a lovely week. Good luck growing your radishes, Veronica. Sounds like a great idea, to grow them under the tunnels! I adore your description of this wonderful radish! I am inspired to plant my own! Oh, Karin, DO: they are so easy to grow and you’ll love them! They look beautiful. I’m not a fan of radishes though so I’m not sure I’d like the taste. Do they taste much different? Thanks for sharing the recipe ideas. They taste different from the smaller radishes–it’s a sharp, juicy, . . . um . . . you’re just gonna have to try them to see! We have a grocery store nearby that caters to a different crowd. One that came from farms, one that is and was poor, one that relishes (pun intended) fresh vegetables, simple fish, and simple ingredients. I have been shopping there for some time – enjoying the fresh vegetables and fruit that are not always found in the more conventional shops- at prices that I certainly enjoy! They look great, and it will be a project of mine to see if I can find any at the farmers market that I visit each weekend. Nice picture, and the recipes look pretty enjoyable also. Chef, if you can’t find any there, and if you have a garden spot in the spring, they’re awfully easy to grow! I shredded one up in coleslaw today for lunch, and it was delicious and so beautiful.